That's why Bliss-Box as a 360 mapping option. 2. I don't think this will help, as the button mappings would still be different, no? Or are you saying that it essentially mirrors RetroArch's 360 mappings??? newoski FIY I'm not using xpadder at all (why are you using it? Is your ipac in game pad mode? I don't have Xbox controllers. My 4-play is being used for nes, snes, n64, megadrive, ps1, ps2, and pcengine controllers. It's late here and I just read your setup. Wow it sounds super complicated, my head can't make sense of it. I'll reread in the morning. Alternative Mapping: Two main Buttons + Start, then D-Pad direction to set mode, Up = Normal Mode; Down = Sony Playstation 3 Mode; Right = Xbox 360/One Mode; LEFT = Arcade Mode (available since 1.57). Sony Playstation 3 – Mimics a PS3 controller layout. Start + select, is the HOME button. Arcade – This mode is for arcade setups. All buttons map in an 6 button arcade like style and all d-pad controllers without analog will send the d-pad as digital buttons. Normal – This is the normal mode best set up for running emulators. Respectfully, the manual needs some additional info. There's not enough info or context to make sense if it. Based on that description, the only benefit is the ability to press XBOX guide button? ulao just a quick question. I am having trouble with one particular nes controller of mine. Not sure if the board is gone. It doesn't seem to detect consistently when I'm plugging it in across any of the ports (i have another nes controller that works fine). I'm suspecting it is in "Atari mode". I press a or b and the input is left. What should I try? Should I unplug the USB? Or press the reset button or hold the reset button? Or something else. Well that was taking out of contents. the above lines may help a bit where it explain that you press buttons on a controller to activate modes. naturally pasting a live doc here would be very counter productive. Your guess is correct, its a loose wire inside the nes controller. Well naturally that was taking out of contents. the above lines may help a bit where it explain that you press buttons on a controller to activate modes. Pasting a live doc here would be very counter productive. Here is a small glimpse at the new API and how it will handle button mappings. In the image each button follows this. The code in the image is setting HID assignments to that set up. It's based from the psx controller but you can use it for anything as Bliss-Box has a global mapping. The API will also be able to give you the controller connected and with that you can apply new mapping to the adapter. I can do that in xpadder. No mapper will solve the problem I'm describing, outside of being able to remap bliss box mappings. which file do you need exactly? I'm not sure, as I only know xpadder. The equivalent of your controller layouts and per say mappings. Auditing Bally Astrocade brought to mind something I wanted to remind Bliss-Box users of. Namely that Bally Astrocade controllers do work via Bliss-Box, are super cool and unique, and kinda hella rare. As one of the oldest detachable controllers in existence it might be worth your while to track some down while they're still relatively reasonable to find online if they interest you. I had to buy a full working Astrocade to get mine due to time constraints for firmware testing. In general, there are several controllers and peripherals with pretty limited release runs that are only going to become more scarce as Bliss-Box opens up the market to basically everyone who has a PC, so you can anticipate rare controllers to become even more of a commodity, particularly following Bliss-Box's next big release. Some other things that are particularly hard to find: Atari Jaguar Pro Controllers (the Jag is pretty much useless w/o this baby), GCE Vectrex controllers (really cool to have and hard to find in good working condition), and basically any non-JP controller. Anything that released in Asia for the most part is still extremely common with a few exceptions. Avar, as always thank you for spreading the word. I did want to add one of the more impressive new features, LCD writing. This is going to be a very easy mechanism for emulation developers. I strongly encourage everyone to spread the word on this. You do not need any drivers or plugins just way to send data to basic HID calls. 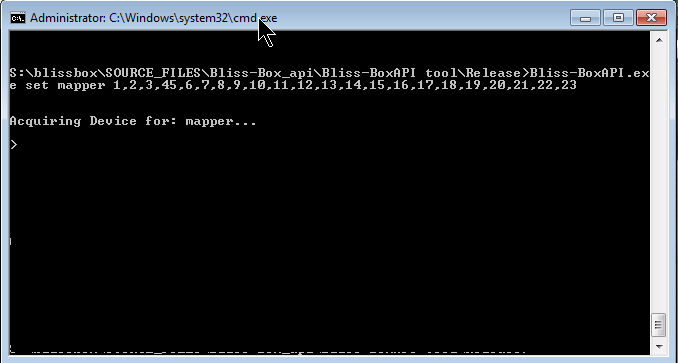 I'll be releasing the source code for the command line and C# to show how simple this will be. Will command line / API programming of controllers be available on the controllers level, or the Port level only? If we were only using Port1, would we be able customize the button programming for NES, SNES, and N64 controllers, independently of eachother? Or would we only be able to make changes at the Port, not controller, level?